The example scripts constains a PDFViewer program. This is a simple example of how to display multiple pages PDF documents. Tested on some documents and it seems that anything PDF related on OS4 that we can see before cannot reach this quality (maybe true for the other Amiga systems too). It is MUCH faster, really MUCH faster and more compatible than AmiPDF, or qpdfView. Based on this Hollywood Plugin somebody can write a full featured PDF viewer many times faster than any other implementation we have today. And somebody will do this, I am sure on this. It is really advance the useabilty of this platform! I would be happy to have the browser engine plugin of that very popular browser! Yeah, this would be sweet. It would be a huge job to write a totally new PDF/DTP editing program from scratch, even with this cool plugin. Just tested a quite large PDF file and it seems to be faster, however it can make wrong assumptions comparing a simple example program to a more feature rich one. Other important thing that it is more accurate even than VPDF. - left VPDF 1.1 don't show images on this page. 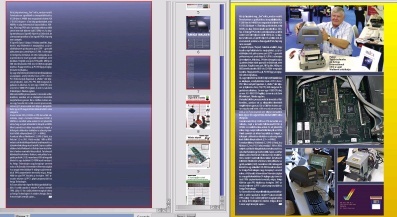 - rigth Hollywood Polybios based PDF viewer shows the same page. Last edited by Lazi on 14-May-2018 at 03:56 PM. Hooo, this is really great! My biggest problem with PDF on Amiga is "fill-in" PDF forms. Does the Hollywood PDF viewer allow typing into PDF forms? As far as I can see currently no. You can create PDF documents with several type of objects in it and can get PDF pages as bitmap or vector graphics. But I think not pointless to support the author! Great work as usual Andreas! Last edited by Develin on 14-May-2018 at 09:44 PM. Are you referring for the MOS VPDF? Polybios PDF viewer based on PDFium (hence the funny reference to the "very popular browser by a very well-known American Internet company"). Orginal VPDF is from MorphOS yes, but the source is available since the release of MorphOS 3.10 so it should build easy since it's allready ported once at least. I must say this all sounds pretty darn good, but I'm still wondering, why does does it sound like a multiple BIOS you'd stick on a ROM? Oh, some misunderstation is here. What browser? Polybios using the PDF viewer engine PDFium. The PDF page rendering engine itself is utilised by Hollywood. The browser is mentioned only because it is the same engine that Chrome used to display PDF files.